The time of PCMCIA/CardBus adapters is quietly running out. Modern laptops are increasingly remove the traditional PCMCIA/CardBus slot. However old 16-bit cards are still widely used in different applications. - CardWare 7.0 for Windows 10/8.x7/Vista and Server 2012/2008 starting with version 7.00.010. - CardWare 7.0 for Windows 2000/XP and Server 2003 starting with version 7.00.019. The OmniDrive USB2 LF supports 16-bit cards, including (with some limitations) ATA, FLASH and SRAM cards. CSM GmbH supplies driver and software for OmniDrive USB2 LF drive. You should not install CSM software with CardWare. CardWare provies all support required for the device. Even more, in addition to standard PC Card interfaces, CardWare also provides a software interface compatible with CSM's PC Card SDK. In order to support the USB-2-PCMCIA adapter under modern Windows version, you need to install CardWare 7.0 for Windows 10/8.x/7/Vista and Server 2012/2008 version 7.00.010 or newer. Windows 8 and Windows Server 2012 support is available starting with version 7.00.011. We recommend to install CardWare before connect the USB-2-PCMCIA adapter to your system. During the installation, please confirm that you would like to install both: "APSoft Memory Technology driver" and "APSoft Universal Serial Bus Controllers" (Please be patient: installation of each driver takes about 15 sec. each). In such case CardWare will pre-install required driver into Windows Device Store and will configure adapter properly at the first connection. 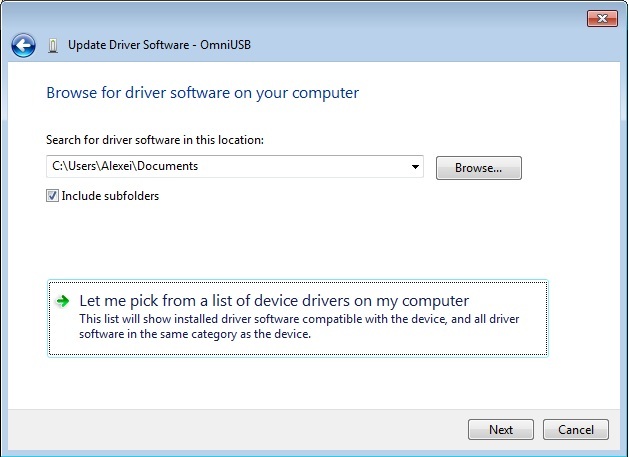 If you connected OmniDrive USB2 LF before CardWare installation, Windows automatically will automatically install USBSTOR.SYS driver for it (see left picture). 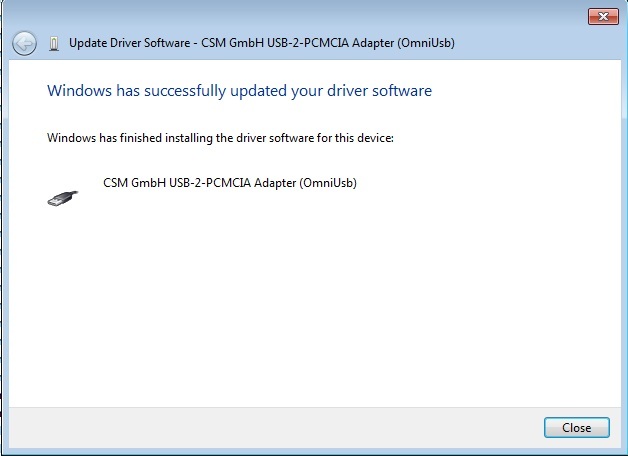 If you installed CSM GmbH software before CardWare, OMNIUSB.SYS driver will be installed (see right picture). In order to correct this situation please right click on "USB Mass Storage Device" or on "OmniUSB" and select "Update Driver Software". Then follow installation procedure shown below. The USB-2-PCMCIA adapter is not supported under Windows versions prior to Windows XP SP3. The USB-2-PCMCIA adapter is supported with CardWare for Windows 2000/XP and Server 2003 version 7.00.019 or later. 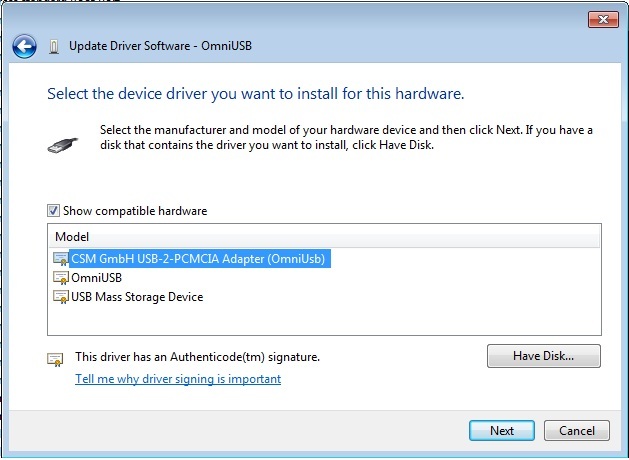 Please do not install CSM OmniUSB driver and software - CardWare is sufficiant for device support. By default Windows 2000/XP and Server 2003 install USBSTOR.SYS driver to support USB-2-PCMCIA adapter. Therefore after installation of CardWare you need to modify driver assignment manually. 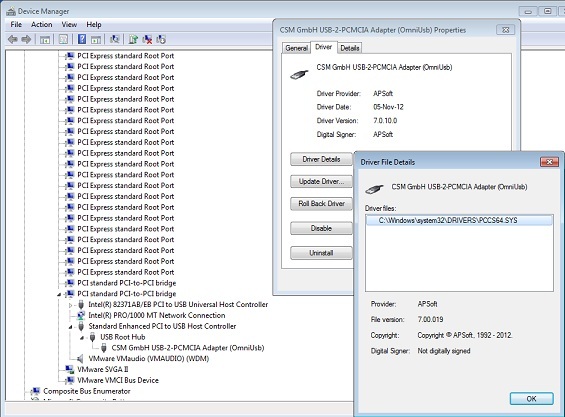 After CardWare installation and system restart, please connect the USB-2-PCMCIA adapter to your system. 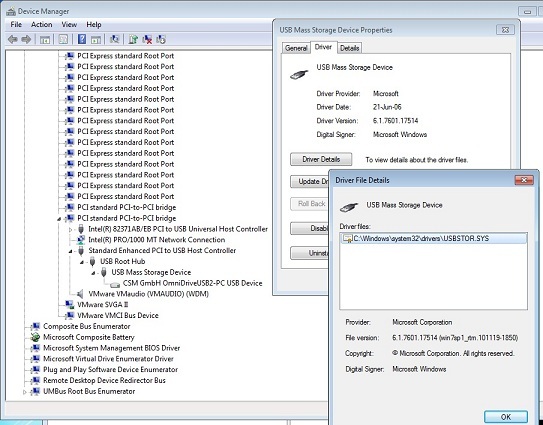 Device Manager will show that adapter is supported by USBSTOR.SYS driver. In order make the adapter functional, you need to update driver manually. 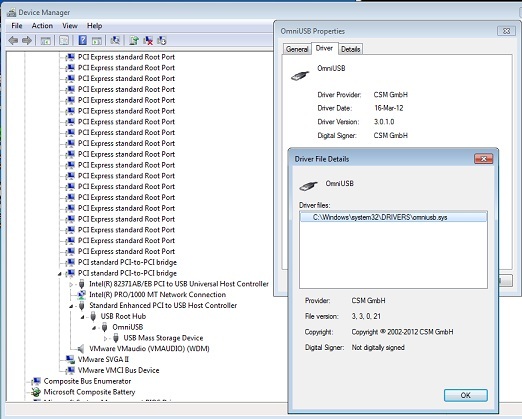 For achieve this, please switch your Device Manager into "View by Connection" mode and locate your adapter in the device tree. 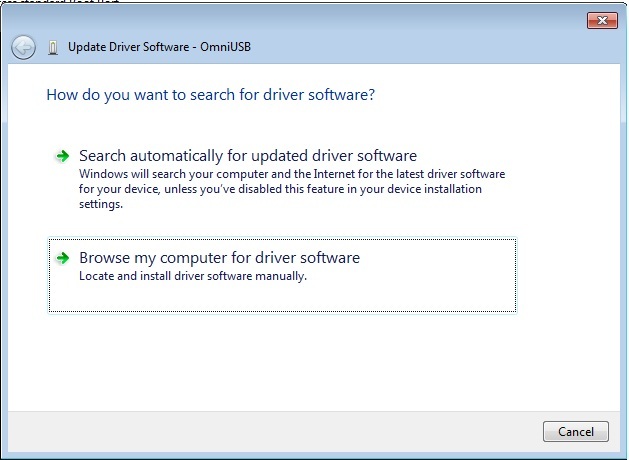 Right-click on USB Mass Storage Device and select "Update Driver Software". The full installation procedure is shown on screenshots below. 1. Battery status is reported improperly. We found that OmniDrive USB2 LF always reports that card battery is good, even if card battery is removed. This hardware problem. 2. 8-bit only cards are not supported. The OmniDrive USB2 LF do ot support pure 8-bit cards. Cards must be able to handle 16-bit access. This is hardware limitation. 3. Some FLASH cards are not supported. We found that some FLASH cards can be read, but cannot be erased or written. Please contact CSM GmbH for list of supported flash cards. 4. Some FLASH cards are formatted much slower as with CardBus adapter. This happen because OmniDrive USB2 LF doesn't support erasing of flash Erase Blocks in parallel. 5. Write on FTL partition on several cards is slower as with CardBus adapter (~10kB/sec). APSoft may implement caching of write operations in the furter, if enough customers will request such feature. 6. Many ATA cards are not working. We found that many ATA cards (especially rotating ATA cards, such as Calluna cards) are not working. This is hardware limitation of OmniDrive USB2 LF. Please contact CSM GmbH for list of supported ATA cards. APSoft will appreciate if you will share with us your own experience with OmniDrive USB2 LF by sending an e-mail to support@tssc.de with word "CardWare" in the subject line. APSoft is ready to implement any other USB-2-PCMCIA adapter, if device manufacturer will supply us with hardware sample and technical information.